Mixenden United became the first trophy winners of the Halifax AFL campaign when they sealed the Division Three title on Saturday. The Natty Lane outfit, who returned to the league in the autumn after a season out, had one of their sterner tests away to Shelf FC Reserves before emerging 2-1 winners. They were not helped by two players struggling to find Shelf’s well hidden ground at Westwood Park. Co-manager Dave Graham had to pull on his boots to give them 10 men to start a goalless first half. With a full complement, Travis Allinson and late arrival Callum Blezzard scored in quick succession but Ryan Lanfear scored late on for Shelf to keep Mixenden on their toes. In truth it was a case of when rather than if Mixenden would clinch the silverware. They had won 14 in a row since losing their opener 3-2 at home to Brighouse Sports Reserves and have powered into a 20-point lead. Flying Dutchman beat Warley Rangers 6-0 in Saturday’s other game in the section to boost their hopes of finishing runners-up. Manager Shaun Martin put defensive midfielder Nathan Cleary up front and he opened the scoring approaching the mid point of the first half. Dutchman missed some good opportunities before Matthew Seekins doubled their lead. Warley were better at the start of the second half but captain Josh Martin and substitute Ryan Seekins scored in quick succession to kill off their challenge and top scorer Martin Redman and Carl Smith completed the rout. 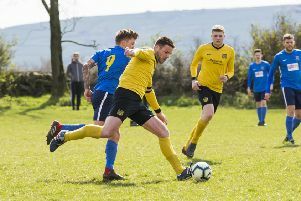 There was a big shock in Division Two with Plummet Line’s 100 per cent record falling on a trip to play lowly Hebden Royd Red Star Reserves. Plummet, who had won their first 11 league games this season, lost 6-5 at Mytholmroyd with Alex Conwell hitting a hat-trick for the hosts. Liam Calvert scored twice for Plummet, who had Niall Carrington dismissed. The two Daniels - Lax and McCleod - struck twice each as third-placed Junction Inn increased their lead over a Northowram Reserves side just below them in the table to four points. Sowerby United Reserves climbed a place to sixth with a 5-2 win away to bottom side AFC Crossley’s Reserves and Harry Talbot’s goal was in vain for Shelf United Reserves, who lost 2-1 at home to Greetland Reserves. Holmfield went above Illingworth St Mary’s Reserves into third place in Division One after Craig Gladwin got the only goal of their derby clash at Trinity Academy. Nick Green and Jay Thomas struck twice each as Salem went fifth with a 5-3 home win over Ivy House, for whom Leon Hurles-Brook also bagged a brace. Elland Allstars took their chance to end a poor run when beating lowly AFC Crossley’s 4-1 at Greetland.